After sleeping through the night a child’s growing body needs some good sustenance, especially with upwards of 8 hours at school on the day’s docket! Did you know that food literally acts as the brain’s fuel? You’ve probably noticed that you yourself felt sluggish at work when you only had a cup of coffee in lieu of a breakfast. A breakfast doesn’t have to be an elaborate affair. Sometimes we assume that a ‘proper’ breakfast means eggs benedict followed by a bagel with salmon, topped off with fresh herbs. No, let’s face it: real life is often too hectic to allow us to indulge ourselves in this way. Still, it’s important to start the school day right and make sure your kids have at least some whole grain, low sugar cereal for breakfast. It doesn’t take too much effort to take the cereal box from the cabinet and pour some milk in, does it? But what exactly is a ‘healthy’ breakfast? 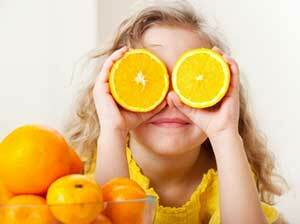 What nutritional components should we try to include in a kid’s healthy breakfast? Do we focus on starch or protein, fat or vitamin intake? Let’s find out. When considering the nutritional components of a healthy breakfast, you should consider your kid’s dietary needs. For example, kids need calcium to keep their bones strong, so try to incorporate some milk or dairy products into the breakfast you put on the table. Second, vitamin C and vitamin A are vital. Vitamin C helps to boost a child’s immune system and speeds up healing if they get a cut or graze, while vitamin A helps growth, vision, and keeps the skin healthy. Foods which contain vitamin C include a variety of fruits: citrus, strawberries, melon, and mango to name a few. 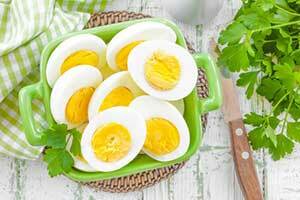 Vitamin A is mostly found in fish and vegetables, but you can also get a dose of it from eating the yolk of an egg. Eggs come up as a good option when you consider another important nutrient that should be included in a kid’s breakfast: protein. Protein performs a variety of functions, including the growth and repair of cells. Functioning cell activity is key to overall healthy, since we are essentially nothing but a bunch of cells! The number one thing that should be minimized in your child’s breakfast is sugar. Sugary cereals adorn the shelves at your local supermarket, but that doesn’t mean you have to give your kid them. Look out for wholegrain cereals, and make sure to read the box to check out the nutritional label. Too much sugar in a breakfast negatively impacts the focus and concentration levels of your kid, and can cause them to act up in class due to the energy kick and crash mechanism that sugar brings on. There are a wide variety of healthy breakfast recipes for kids all over the internet. They’re not just ‘boring’ healthy options either. From breakfast popsicles to banana pops, they’re very inventive. If you struggle to get your kid to eat anything that isn’t donut-shaped, try out some fun recipes and you’ll soon be dumbfounded at how enthusiastic they are about their new healthy eating regime! If you simply don’t have time to prepare a breakfast in the morning, you can still send your child to school with a full stomach and an energized brain by throwing together a breakfast on the go. For example, simply pull a yogurt out of the fridge and throw some fruit and wholegrain cereal into it. Your kid can eat it easily on the way to school: just don’t forget to give them a spoon or things could get a bit messy. If you drive them to school, all you have to do is simply throw the carton away and get the spoon back! Sure, breakfast is what gives your child the kickstart they need to start the day, but don’t forget the importance of lunch while they’re at school at daycare. It’s easy to become complacent about packed lunches and end up giving them the same peanut butter and jelly sandwich day after day. However, they say variety is the spice of life; this applies to what you pack in the lunchbox, too. 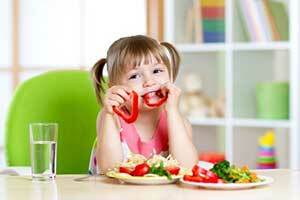 All you need is a little imagination and initiative to come up with healthy lunch ideas for your kids. For example, why not try a wheat tortilla wrap packed with turkey and vegetables or salad of your choice? You can even throw in a healthy side dish while you’re at it: raw carrots with a dip is delicious, for example. Then, for dessert, pack some fruit, a yogurt, or an oatmeal bar. This packed lunch is just one example of many that is both easy to prepare and gives your child the variety in their diet they require. No more sandwich/potato chips/juice combo! It’s important that your kid eats a healthy lunch, but just as important is what you pack the lunch in. Eco-friendly lunchboxes are the future of packed lunches, especially since the recent discovery of the dangers of BPA and other chemicals that can potentially leach from standard plastic lunchboxes. While your kid is enjoying a healthy, nutritious lunch you don’t want them to be at risk of exposure to toxic substances found in plastic lunchboxes. Packing food for the school day into a bento box is much safer for your kid as it is BPA and lead free. These boxes contain a stainless steel insert which ensures that no leaching will occur and your kid can enjoy their wheat tortilla wrap in peace!